Here's my first Christmas card of the season! I'll probably mostly stick with Christmas cards for the rest of the year now, I have so many Christmas stamps (and so many that I haven't even inked up yet!) and so many ideas for them! 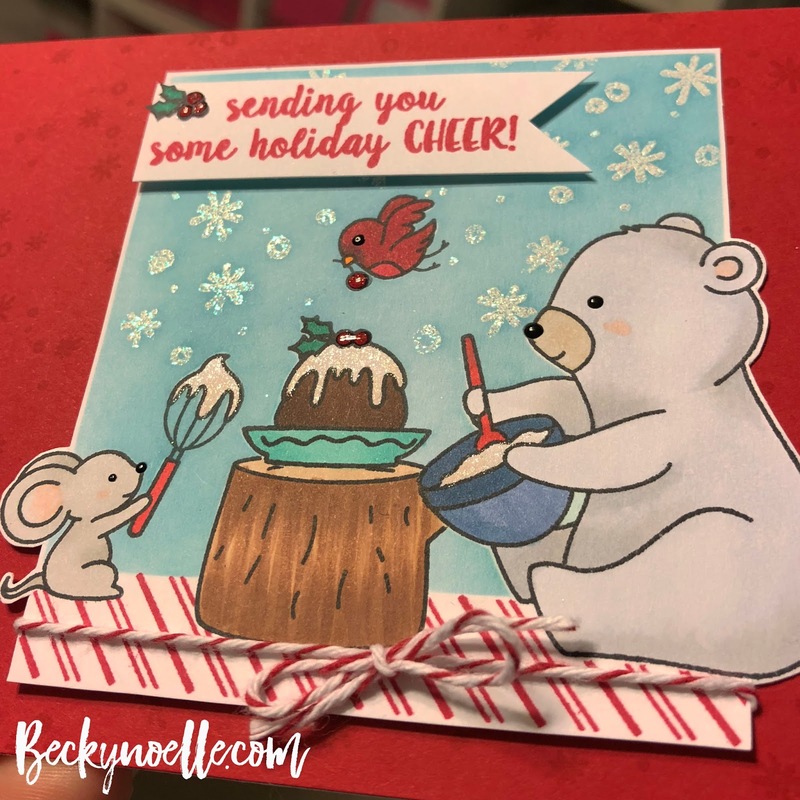 This one uses the adorable Neat & Tangled Holiday Baking set with some masking, copic coloring, and ink blending. And here's an angled shot to share how yummy and shiny everything looks! I really wanted it to fit in a shadow box or a box card but all of my elements ended up needing more space, so they eventually made their way onto a standard portrait card. I actually tasted a PSL for the very first time last month, It was tasty, but not anything I would want more than once or twice a year. My tummy has started having some serious issues with dairy in the last few years so I only consume dairy when I think the taste will be worth it, I suppose I need to try some of my starbucks drinks with non-dairy substitutes. This one was pretty simple all in all. I stamped the main image and cut it out with the coordinating die cut and then cut the tiger out separately so he could swing from the thread. I stamped the trees on the bottom with some masking and then filled in underneath them with the ferns. I colored all of my images with Copic markers and stenciled the clouds with the cloud edge stencil with some Tumbled Glass Distress Ink. I die cut my slider channel and then inked the card base with the cloud stencil where it would show under the slider channel. Next I added the thread and assembled everything. I caved today at Barnes and Noble and picked up a Christmas Cookie issue of Better Homes and Gardens and now I want to bake all the things. I would totally be down for just skipping November/Thanksgiving this year and moving straight to the Christmas season next Wednesday. I'll be back tomorrow with a fun Pumpkin Spice Latte card! I have a couple of pretty fall cards today using Neat and Tangled's pretty Oak Leaf Die. I love love love how pretty and delicate this leaf is. seriously, all the heart eyes. For the cream lace one, I had this idea as soon as I ordered this die, I love partial die cutting and this card makes me so happy. I partially die cut the leaf out of the front of the card and then trimmed out the rectangle around the partial cut. I cut another leaf out of the wood veneer paper and glued that down on top. I just love a card where the inside's just as pretty as the outside! For the inside I masked off the rectangle that would be visible from the front when it was closed and then did some ink blending with my new Distress Oxide inks (ohmygosh where have those been all of my life!?) and then stamped the sentiment in black ink. I finished the whole thing off with some button twine and coordinating sequins. Then I finished and couldn't figure out what I wanted to do next! It's been kind of nuts here lately with Bree. She's still going to speech therapy twice a week, behavior therapy once a week, we're on the waiting list for the developmental pediatrician, and the school has decided to do a full assessment of her to get her into an early learning program. All of the professionals we've seen seem to expect the developmental doctor to diagnose her with autism. On top of all of that, potty training is not going well. Anyways, I've been busy in the studio lately and already have a few more posts ready to go for this week so pop back in and visit!